The past two years, Abby and I have gone to an annual July 3 music potluck/party, and we went again this year. Both in 2012 as well as in 2013, I was too intimidated to participate in music jamming, and only watched. This year I was determined to contribute, and I brought my ukulele (which I only started learning a month after last year’s party, actually) and my Irish flute. After my first round of food at the potluck, I went to Susan’s piano and played David Raksin’s theme from “Laura”, which I had so botched up last month at the annual Pittsburgh Recorder Society potluck/recital. I play it much better now, although I somehow messed up the final chords today. There were a few people sitting around listening, and they wanted to hear more, but I didn’t have any more, so I scurried away to eat more food. As dinner started winding down, the old time musicians started gathering outside to play. I saw fiddles, banjos, and other instruments make an appearance. Inside, the main guy who plays guitar and ukulele unpacked his soprano ukulele, and so I took out my concert ukulele, and two other guys with guitars appeared. Eventually a woman who sang also appeared, as well as a guy on fiddle. I felt very intimidated, because although I’ve gotten some experience jamming while on recorder or flute or tin whistle, my ukulele experience without written music is still very minimal. Nevertheless, I joined in. I fumbled around, and had to ask what key each song was being played in, and even then, I’m still quite shaky in anticipating and knowing chord changes beyond the simplest I, IV, V, and some dominant and major 7th chords. I strummed very softly. They’re a great bunch, improvising melodic lines at will and even making up lyrics right on the spot, just as they had at the last two years when I only watched. And the singing in harmony was fantastic. 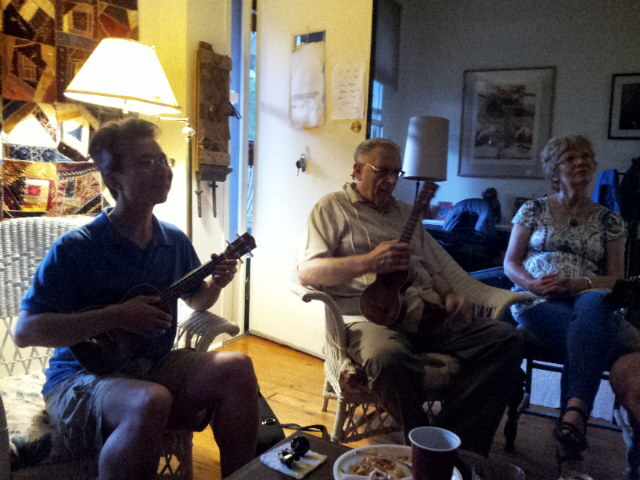 For two years, I was afraid to join in the music jams at this annual July 3 party. This year I joined in a little bit. If we attend the party again next year, I hope to be in a position to contribute even more! Many thanks to Susan for hosting this annual party!